Salman Khan decides to give the contestants a taste of their own medicine by playing a prank on them. Weekend Ka Vaar is probably the most entertaining part of Bigg Boss for Salman Khan fans. The host not only entertains the audience with his wits but also schools the housemates for the chaos they create in the entire week. The first Weekend Ka Vaar of Bigg Boss Season 12 will be featured tonight. Accompanied by Bigg Boss band, Salman Khan will open the show singing the Bigg Boss' version of his popular song Main Hu Hero Tera to Sab Hero Yaha. Apart from this, Deepak Thakur, the aspiring singer has also composed a track titled- There is something special tonight for the actor. Salman Khan decides to give the contestants a taste of their own medicine by playing a prank on them. Believing Salman's prank, the contestants reveal who they disapprove off in the house. While Salman played the prank, the atmosphere goes tense and revelations made seemed to make many uncomfortable. As the night unfolded, Salman couldn't control his laughter anymore and told all the housemates to relax as he was just jesting. 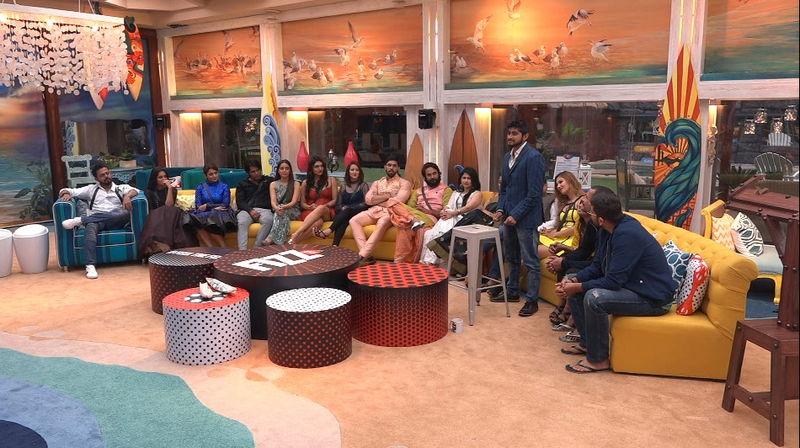 Bringing in the context of pranks, Salman eventually brings up the prank played by Shivashish and the Khan sisters that involved a lot many housemates and had a very dramatic end. Later contestants choose Anup Jalota as the Gunhegaar for the week and he is sent to the torture room. Salman, being a disciplinarian, also pulls the contestants up for their unreasonable argument during the captaincy task.